Have a Dink, and Tune Into Catchin the Big Ones! Tune into Catchin the Big Ones with the Captain for the latest in fishing reports for Western and Central Montana this Friday morning from 8-9am on KGVO 1290am/98.3fm in Missoula. You can also listen online at http://newstalkkgvo.com/listen-live/popup/. 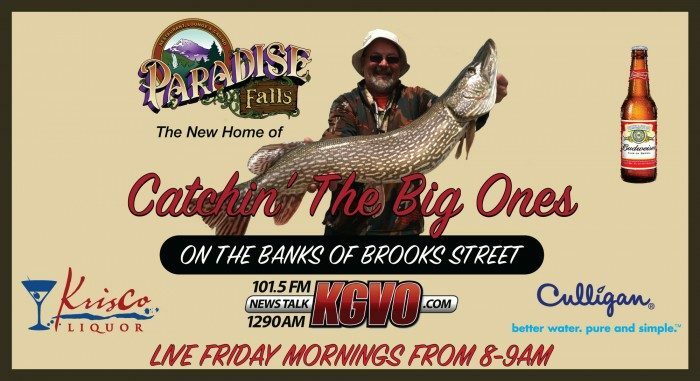 The show is broadcast live from Paradise Falls on the” Banks of Brooks” Missoula Bill Brown from Bob Wards, Carolyn Persico from Rock Creek Fisherman’s Mercantile will have reports. Teresa Mondale from United Country Real Estate will test your knowledge with trivia. Bob Culp will have information on Helena Reservoirs along with Ryan Corwin from Bob Ward’s Sports and Outdoors, and Don Beardsley will have a recipe to tantalize your taste buds. Keep up to date with Outdoor updates from the Desk of Downrigger Dale and a whole lot more! Pour all ingredients into glass filled with ice, stir, enjoy.